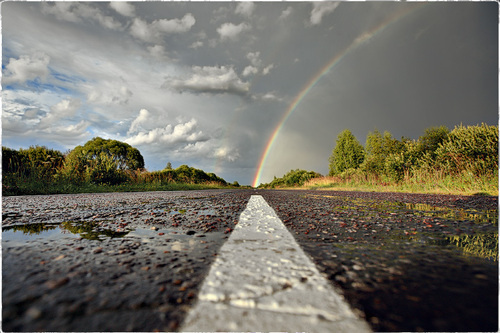 Chasing after the rainbow … sigh … How many times have I done this? Enough to know that what awaits you at the end is not a pot of gold. No what awaits you is just as a friend of mine once said … “emptiness, frustration and disappointment”. However, our society would have you think differently. As a society, in our pursuit to happiness we have adopted an “anything goes” attitude. Where do we draw the line? When do we simply become content? We continue on our search in the next best thing, trading out the old and comfortable for the new and exciting only to be met again by emptiness, frustration and disappointment. Why? Because the things we are chasing … these rainbows … are never-ending. They will go on as long as our eyes focus on the “riches” they promise to provide. It’s time to start saying no to ourselves and start saying yes to God. It’s time to begin pursuing Him with a heart that desires nothing more than to be in His will. It’s time to begin to live the life Jesus died to give us! Will you join me and embrace this freedom?